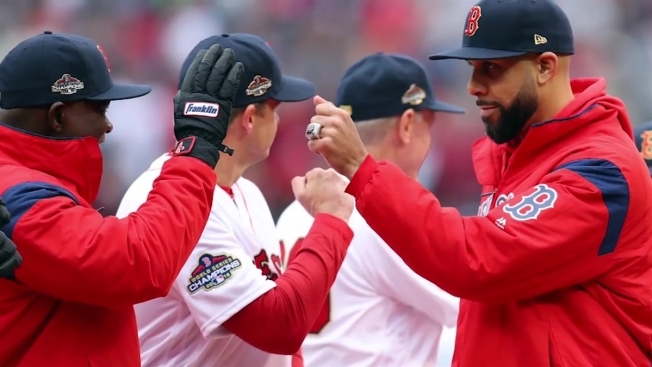 The Red Sox received their much-anticipated 2018 World Series Championship rings during Tuesday's home opener against the Toronto Blue Jays. The rings were handed out to the players, manager, and coaching staff in a ceremony ahead of the game for winning last October's World Series over the Dodgers. The championship rings, made by Jostens, have 185 stones which represent the 162 regular season games plus 14 postseason games and the 9 World Series titles now held by the Sox. Each ring features 4.5 carats of diamonds, 6.5 carats of blue sapphires and 4.0 carats of rubies. The top of the ring has the signature red "B" logo over a blue sapphire backdrop. One side of the ring features eight small pennants and the largest pennant paying tribute to the last franchise win. The other side is dedicated to each recipient of the team. On the interior of the ring is 10-28-18, the date of the World Series victory and the team's famous "Damage Done."